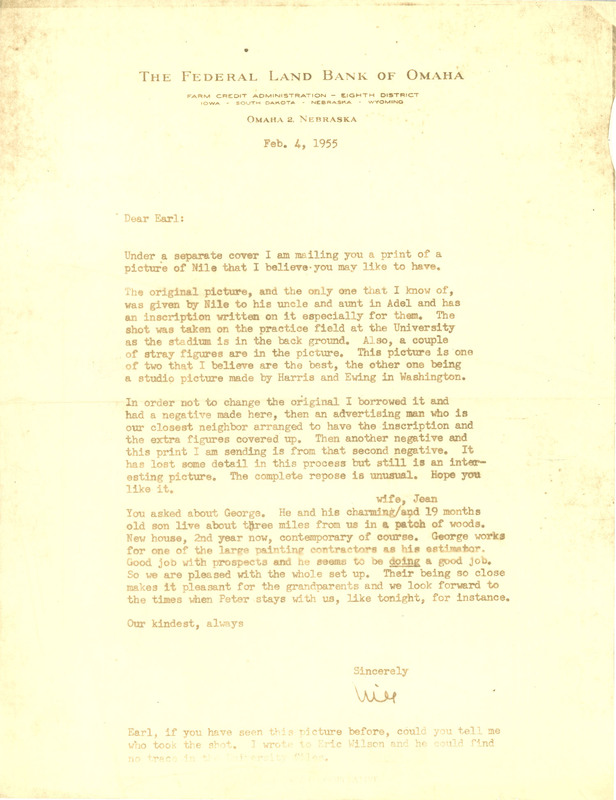 The Federal Land Bank of Omaha Farm Credit Administration - Eighth District Iowa - South Dakota - Nebraska - Wyoming Omaha 2, Nebraska Feb. 4, 1955 Dear Earl: Under a separate cover I am mailing you a print of a picture of Nile that I believe you may like to have. The original picture, and the only one that I know of, was given by Nile to his uncle and aunt in Adel and has an inscription written on it especially for them. The shot was taken on the practice field at the University as the stadium is in the back ground. Also, a couple of stray figures are in the picture. This picture is one of two that I believe are the best, the other one being a studio picture made by Harris and Ewing in Washington. In order not to change the original I borrowed it and had a negative made here, then an advertising man who is our closest neighbor arranged to have the inscription and the extra figures covered up. Then another negative and this print I am sending is from that second negative. It has lost some detail in this process but still is an interesting picture. The complete repose is unusual. Hope you like it. You asked about George. He and his charming wife, Jean and 19 months old son live about three miles from us in a patch of woods. New house, 2nd year now, contemporary of course. George works for one of the larpe painting contractors as his estimator. Good job with prospects and he seems to be doing a good Job. So we are pleased with the whole set up. Their being so close makes it pleasant for the grandparents and we look forward to the times when Peter stays with us, like tonight, for instance. Our kindest, always Sincerely Nile Earl, if you have seen this picture before, could you tell me who took the shot. I wrote to Eric Wilson and he could find no trace in the University files.